VERIFY: Can you bring your kid, take a photo at Maryland polling stations? Can you take your kids to the poll station? Can you take a photo at polling booths in Maryland? Can you take your kids to the poll station AND can you take a photo at polling booths in Maryland? You are ALLOWED to bring your munchkins, but leave your cellphone or camera in your pocket – those are NOT ALLOWED. Maryland State Senator Will Smith tweeted out a photo with his baby daughter at the polling station. A Verify viewer reached out to us asking whether that's allowed. You asked, we verified. A precious tradition that must be passed down from one generation to another. Remember, today is the last day to vote early in Maryland. Polls will be open from 10:00am to 8:00pm. To get the answer our researchers asked the experts. In Maryland, it's totally fine to bring your kids to with you into a voting booth, according to Maryland Attorney General Brian Frosh. You can bring up to two children under the age of 18. In Virginia you can only bring one kid under 15 into the voting booth. In D.C. you can bring as many of your kids as you want. There's no age limit, either, according to DC Board of Elections spokeswoman Rachel Coll. 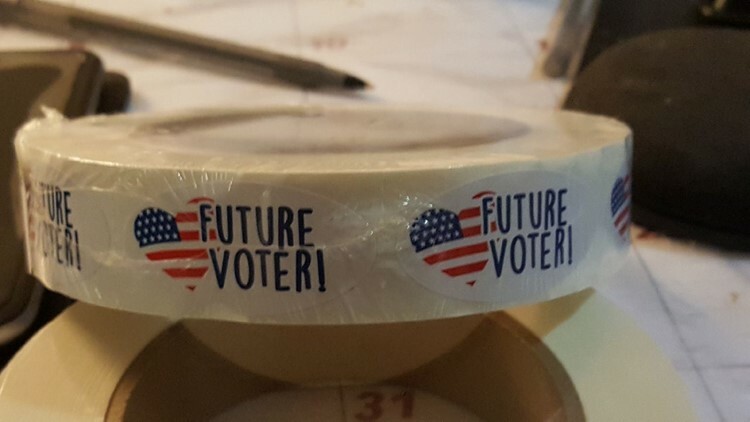 They'll even get a "future voter" sticker. But what about taking a picture at the polls? In Maryland, you're not allowed to use cell phones or any other electronic devices at polling stations. Experts infer that photos at the booth are off-limits. "In some states it's perfectly legal to take a photograph of yourself casting a ballot, in may other states it's actually explicitly illegal," Sarah Jackel, general counsel at Vote.org, said. "In other states it's a little bit more gray, like Maryland, where you are prohibited from bringing an electronic device into a polling location, which would seem to prohibit you from taking a selfie or having someone else take a photograph of you," Jackel said. "The use of electronic communication devices is prohibited inside the polling room. Prohibited devices include radios, televisions, cameras, cellular telephones, tablets, pagers, and computer equipment." So we can Verify, yes, Senator Will Smith was totally allowed to bring his baby girl to vote, but he should have taken the picture outside. Our researchers reached out to Senator Smith but did not receive a response. In Virginia, Attorney General Mark Herring issued a formal opinion in 2016 saying ballot selfies are LEGAL in Virginia.